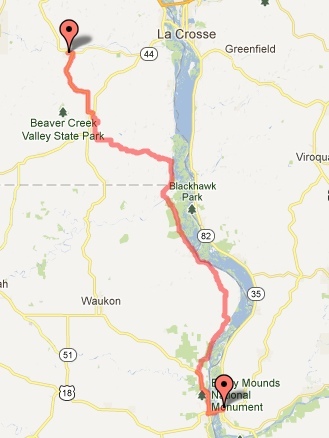 Our last day of the Upper Mississippi River Cycling Tour. 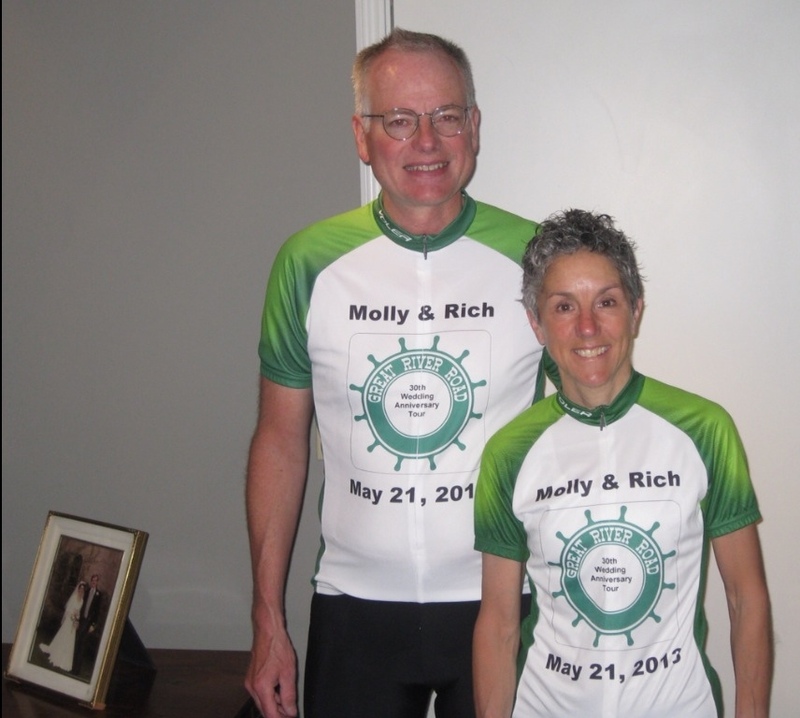 Even after seven straight days of cycling, I was sad to see our trip nearing completion. On the other hand, I was eagerly looking forward to the 30th Wedding Anniversary Celebration that awaited us at the end of the road. It wasn’t the most beautiful day, with clouds overhead and temperatures in the low 50s, but a day earlier the forecast was for rain, so I considered it a good day! The winds had picked up too, but fortunately they were mostly behind us – a treat after all the headwinds we’ve had on this trip. My head was definitely in a different place today. It wasn’t the same as the other days of our tour, when we were fully in the mode, taking in all the sights and making the most of the journey. Today was really all about the destination. 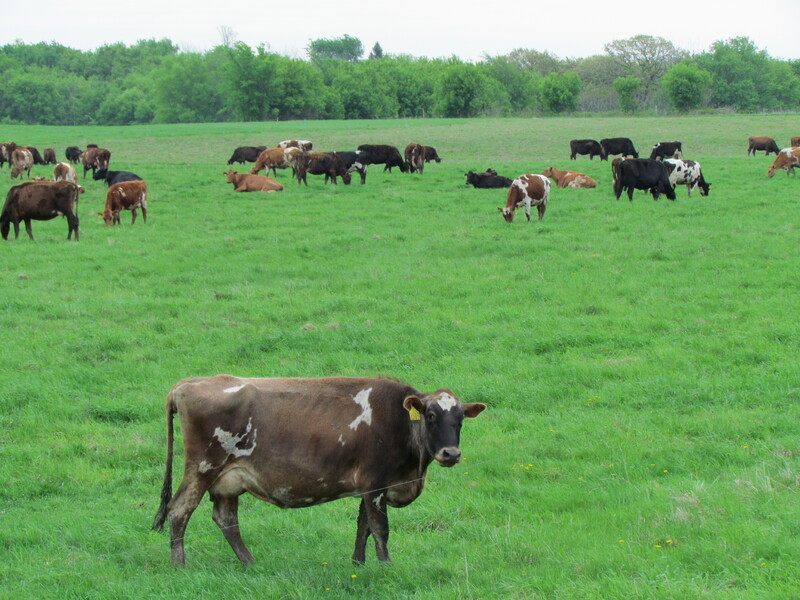 Sure the farms were picturesque, we enjoyed the cows and horses in their pastures, and we had a tasty stop at Patty’s Place for a snack in New Prague. But we were eager to reach the end. The closer we got to the outskirts of the Twin Cities, the more the farmhouses looked like suburban homes. They looked a bit incongruous in the center of large working farms. We encountered our first lake with about 10 miles to go. We’d seen plenty of rivers and ponds, but no true Minnesota lakes. We were zeroing in on home territory. 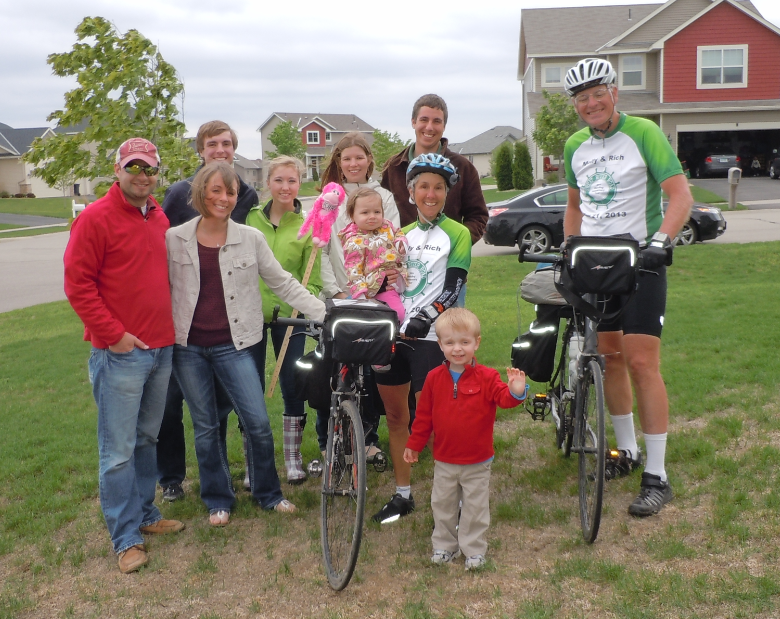 As planned, we rode to our daughter’s house where all of our children, grandchildren and a few close friends were gathered. We had a lively welcoming party, as they cheered us down the final street to the house. The afternoon was pure enjoyment, surrounded by those we love. It was filled with much laughter, many hugs, good food and warm feelings. Our kids collaborated on not only the party, but the entertainment. In true Brewer style (ie my family’s tradition) they collectively authored an epic poem, which they recited with great animation to commemorate our lives together – meeting, dating, marrying, birthing and parenting. It was an amazing piece of work and an hysterical tribute. Karen upheld her theme cake decorating reputation, producing Cake Cones in honor of our detour to the Dairy Queen after our wedding 30 years ago. 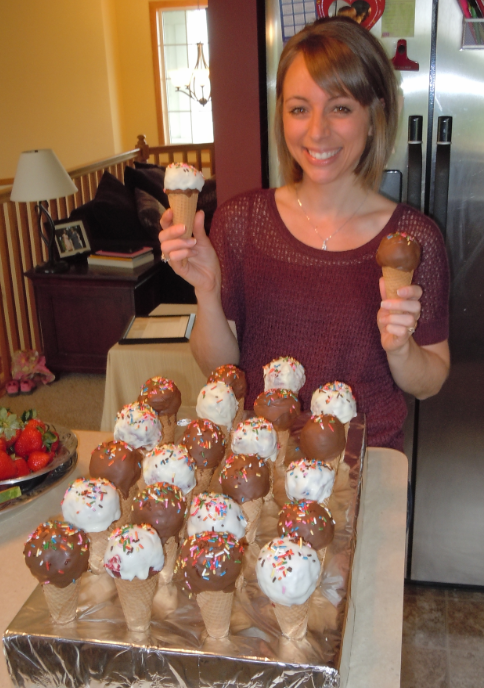 That called for a re-creation of the scene when we arrived at our reception, cones in hand, linking arms to lick them! The tour is finished, but the memories will live on. 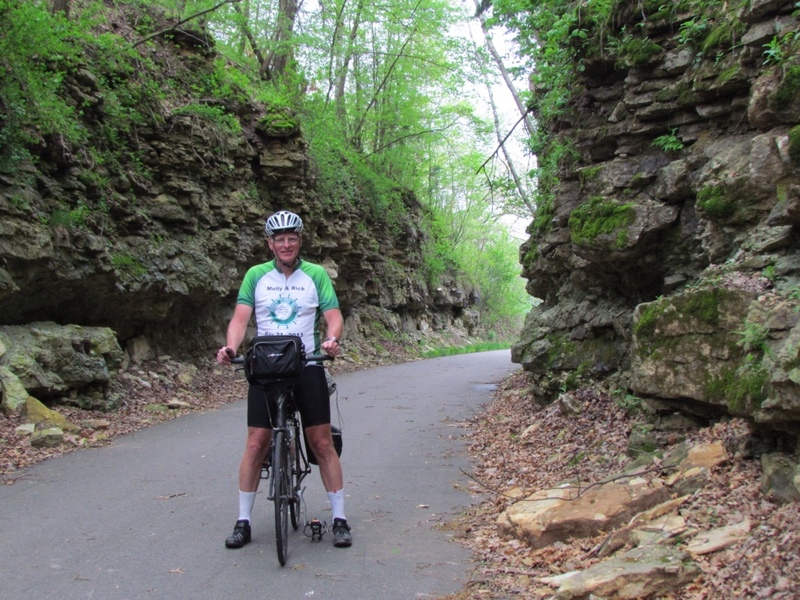 We had many great moments on our trip – met wonderful people, worked through cycling challenges, appreciated beautiful scenery and appreciated experiencing it all up close from the seat of a bicycle. But the best memories will be holding tight to our family members and friends at the grand finale. It was just perfect. We emerged from our tent out into a clear crisp morning. The sun was already warming the chilly air, but not before we noticed the frost on the picnic tables! We stuck to the sunshine as we packed up our sleeping bags and tent, drying them out from the heavy dew as best we could. It felt good to be outside and moving, and we deemed the camping experience a complete success. 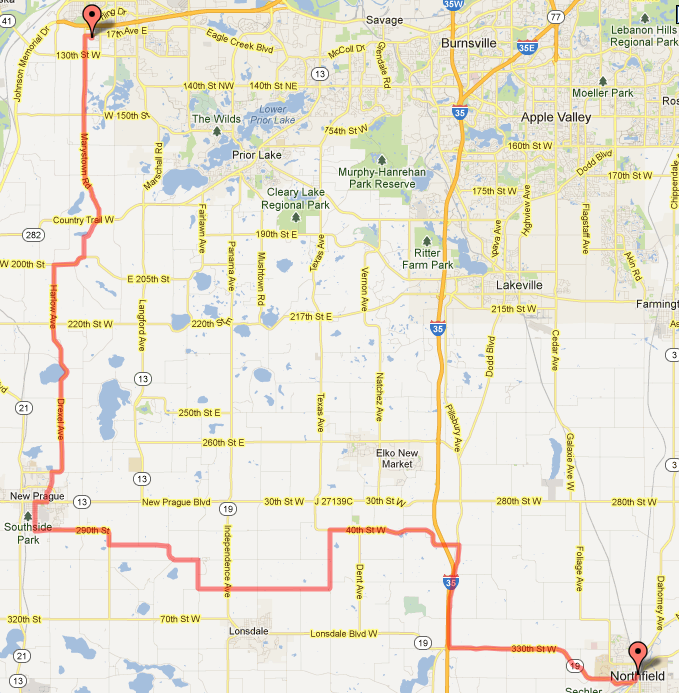 We knew we had a shorter ride than usual today, due to having altered our route yesterday. 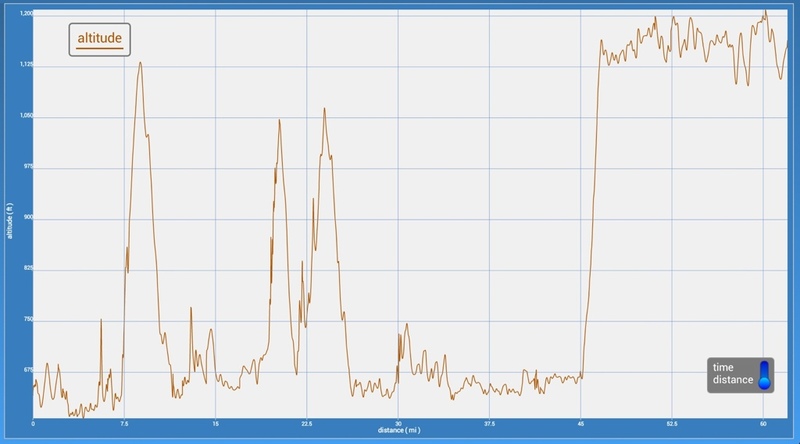 And with the change in wind direction, we had a tailwind for a change to help us make good time. So we allowed ourselves a leisurely breakfast at the coffeehouse, which had the added benefit of wireless Internet. That set the pace for our day. With brilliant sunshine, reasonably warm temperatures and quiet local roads, it was easy to enjoy our surroundings and stop for frequent photo sessions. We passed through a number of nice little towns, and the farmland became picturesque once more. I decided to focus on capturing images of Middle America, or America's Breadbasket as Rich likes to call it in honor of his family's farming heritage. We took a short detour to visit Nerstrand-Big Woods State Park. There the main attraction is the woods, which is the largest remaining portion of the hardwood forest that once covered Central Minnesota. A short hike took us to Hidden Falls, which was both pretty and peaceful. 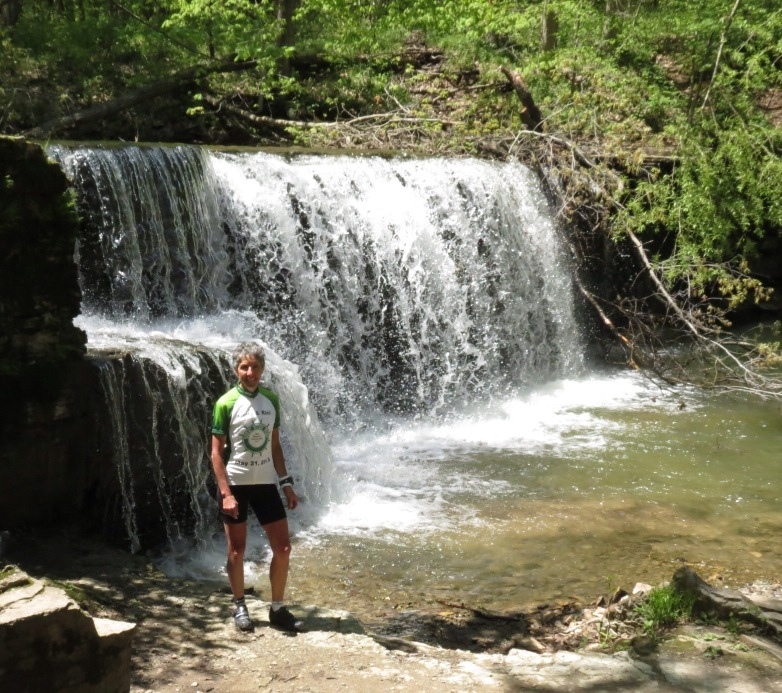 We were sure we could see a secondary falls under the main flow, probably from water seeping through the limestone. Spring was in full force and the woods were filled with new blooming wildflowers. It was a nice respite from our cycling. 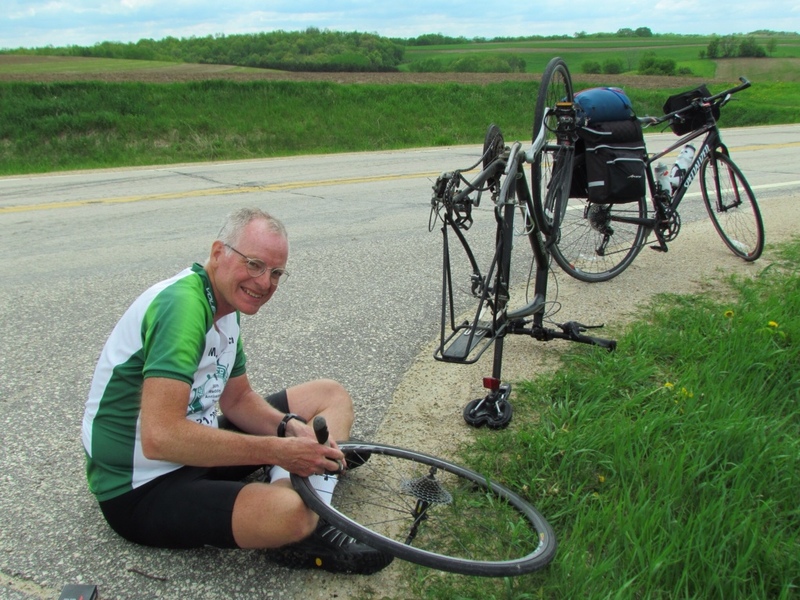 While Rich stopped for a snack in Nerstrand, I ventured down the street to take a few photos. Imagine my surprise when a motorcycle stopped alongside me, and its rider asked where to find Rich! Who the heck could that be? It turned out to be Randy, our host for the evening. We were staying in another Warm Showers home, and knowing our route, Randy decided to swing by and see how we were getting along. We shared a good laugh over that, got advice on the best roads to take, and Rich happily handed over a sleeping bag and tent for Randy to transport. 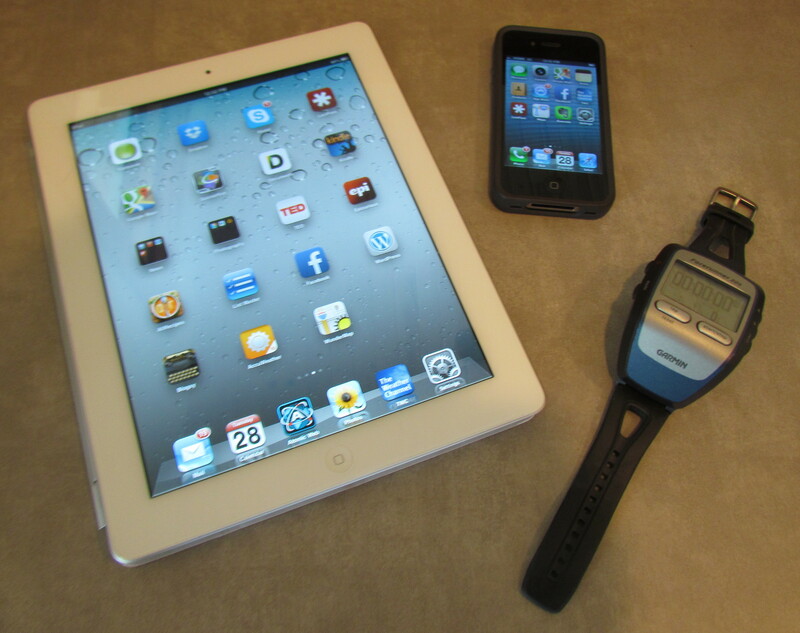 Being a purist – for whatever silly reasons – I held out and continued to schlep my gear. 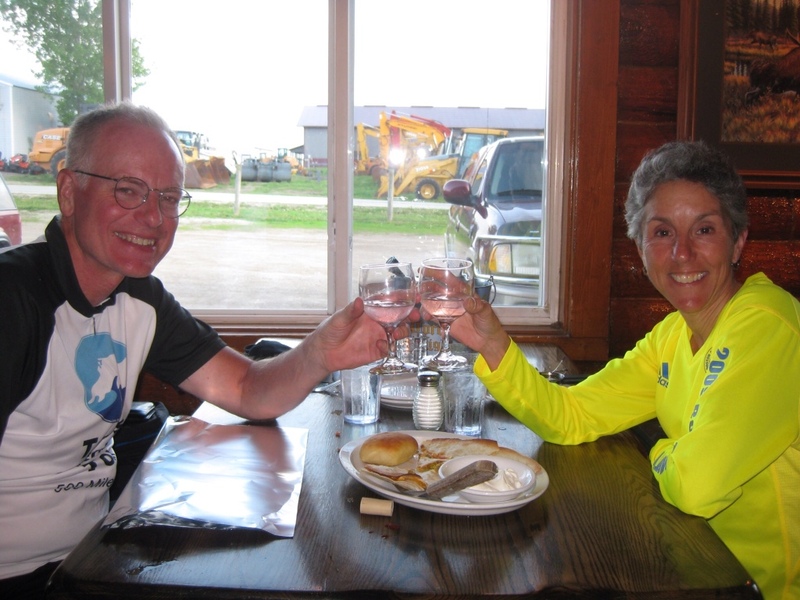 It was an easy peddle up to Northfield, where we quickly settled into comfortable accommodations with Randy and his wife, Lois. Admittedly, after camping the shower was especially welcome. Although Northfield is a nice town with plenty to explore, the idea of having time to relax proved to be a greater draw. We enjoyed a good meal and sharing stories with our hosts, and were happy to continue dallying right on into the evening. We finally did it. We are camping tonight. Just not where we thought we’d be. Instead of returning to the Mississippi River Road and staying in Lake City tonight, our route took a sudden turn to the West. We continued in that direction to Mantorville. Not even on my map. The day started innocently enough, and with a wonderful diversion before we even began cycling. We stayed at the Oakenwald Terrace B&B last night, and came downstairs this morning to feast on a sumptuous 4-course breakfast. 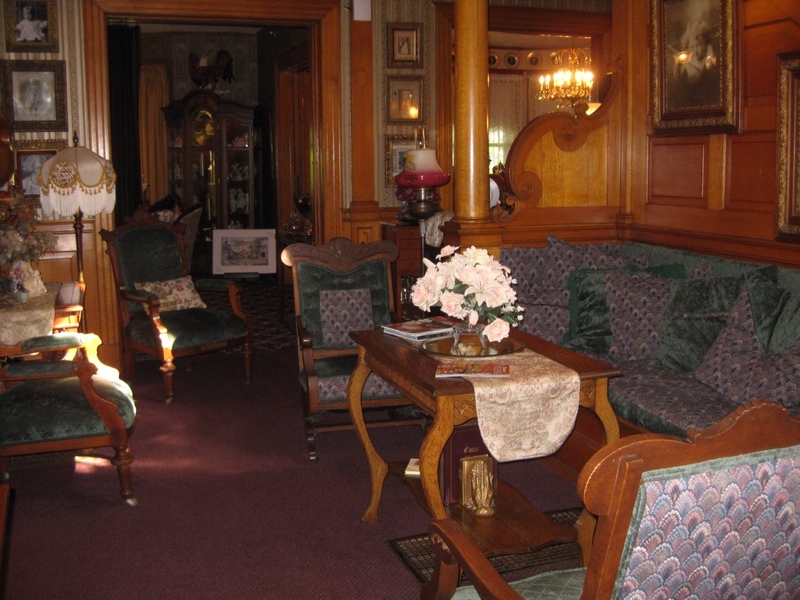 We hadn’t had time to explore the house yesterday, so our hostess took us on a thorough tour after breakfast. 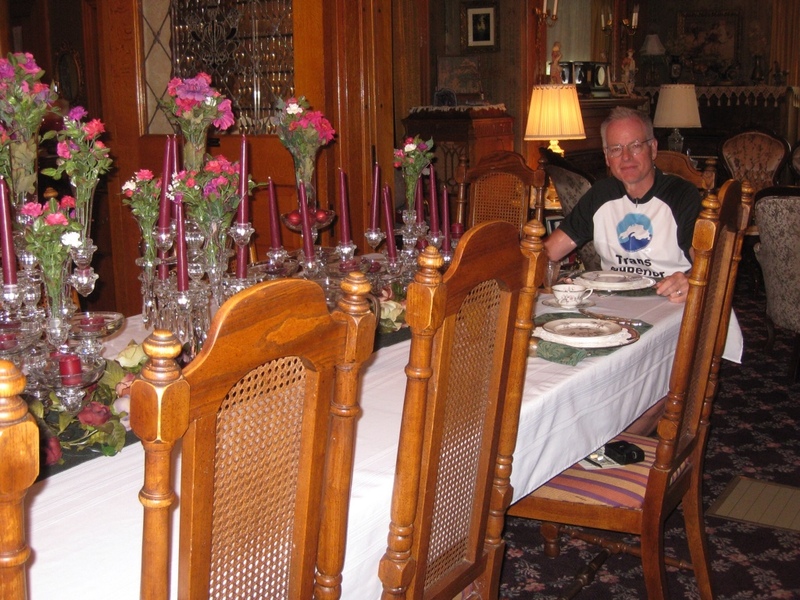 First, it is the largest house we’ve ever stayed in – the rooms are innumerable. 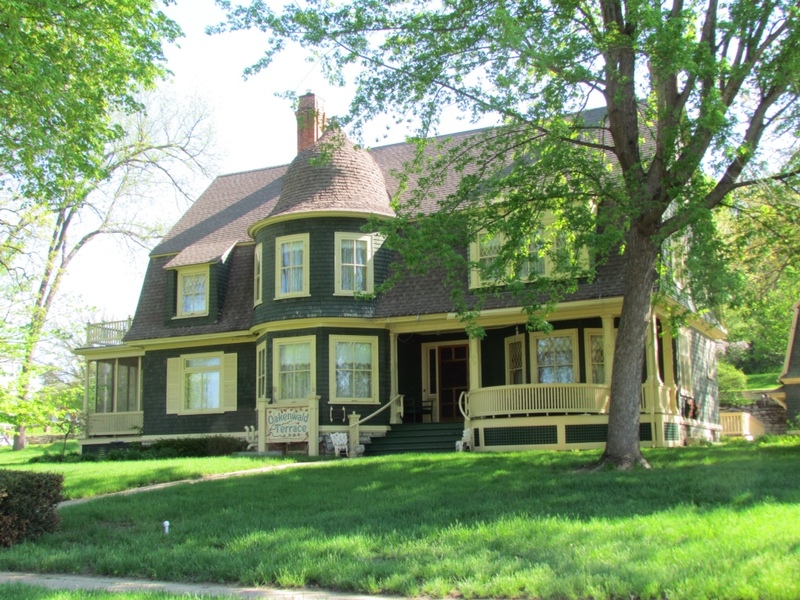 Second, what we found so fascinating is that it is the family home of the innkeepers. So not only are the furnishings and collections of china, silver and figurines family heirlooms, but they have continued to be used throughout the years. We loved hearing the history of the rooms and seeing the beautifully preserved and well-maintained craftsmanship of the home. It is truly a treasure. We headed off in the bright sunshine with the promise of good weather throughout the day. It was a later start than normal, but we had no deadlines to meet and a long day of daylight. We left town in good spirits, and aimed for Lake City. Our route took us Northeast, and as soon as we hit the open farm fields we ran smack into NE winds. This time our battle was compounded by the fact that we were in rolling farmland, so we had continual hills as well as the wind to contend with. And it appeared to be a losing battle. By the time we reached St. Charles just 14 miles away, we knew we were not going to make Lake City. 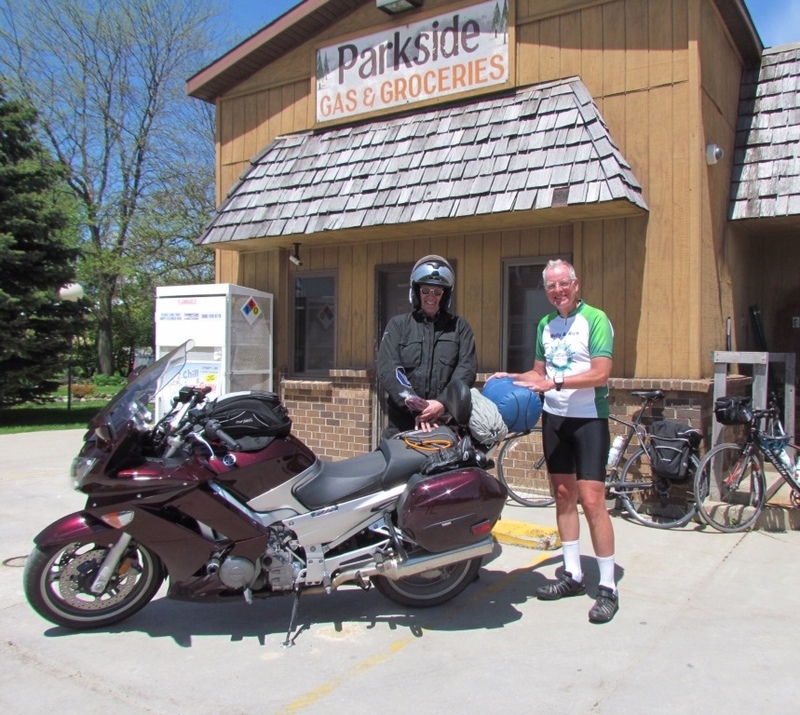 Rather than continue to fight the headwinds, Rich decided the most prudent thing to do was to change plans, work with the wind instead of against it, and head West then North to Northfield. Now I don’t give up easily, even when presented with good logic. So I have to admit to being an unhappy camper (pun intended!) at turning away from the river and ditching the scenic route we’d chosen. It didn’t help that our view was reduced to endless miles of mostly flat freshly tilled farmland with fewer trees and towns to break up the monotony. 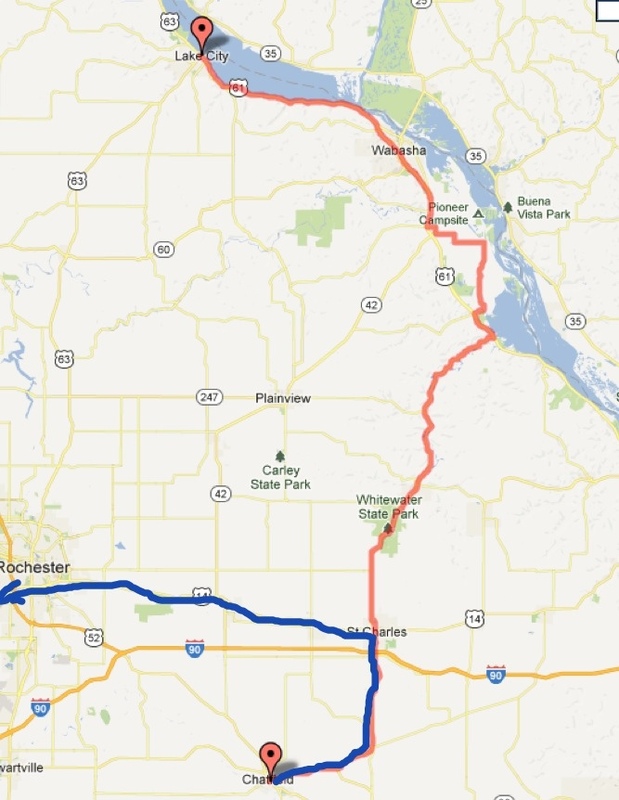 The road continued straight west for mile after mile, and we had to weave our way through Rochester and it’s traffic. It’s not a route I would recommend. Our turning point came during a late lunch stop. Searching the map for a park for camping, we stumbled on the town of Mantorville. Not only did it have camping sites right in town, but it boasted a 12-square-block downtown that was all on the National Historic Registry. Suddenly we were re-energized! We had a destination and something to look forward to exploring. Life got a lot better again after that. 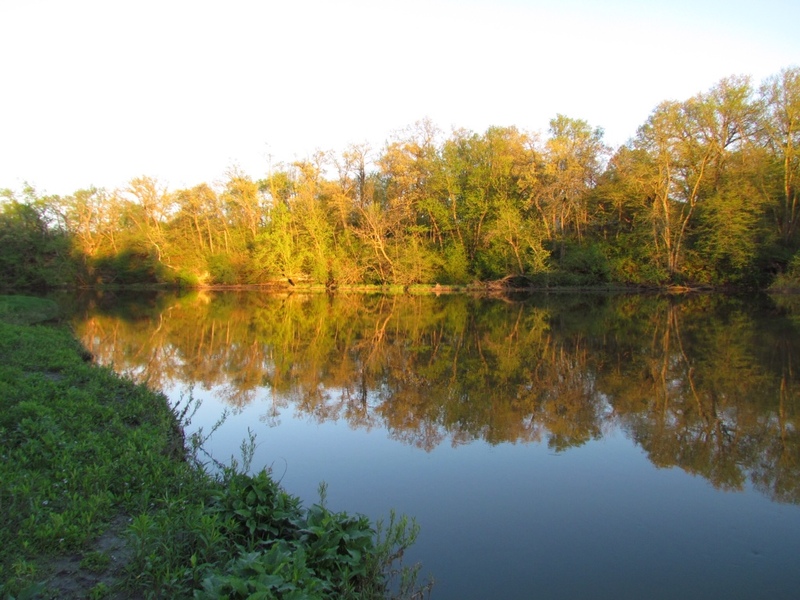 We found the campground to be a lovely area right on the Zumbro River. Like all other rivers right now, it is swollen and flowing rapidly – a wonderful sound to lull us to sleep. Our new tent set up easily, and we were soon off to explore the town on foot. We had dinner at an old restaurant in town, and finished in time to take some pictures in the glowing late light of the day. Having our own tent and sleeping bags definitely lends itself to a high degree of flexibility, as today illustrates. 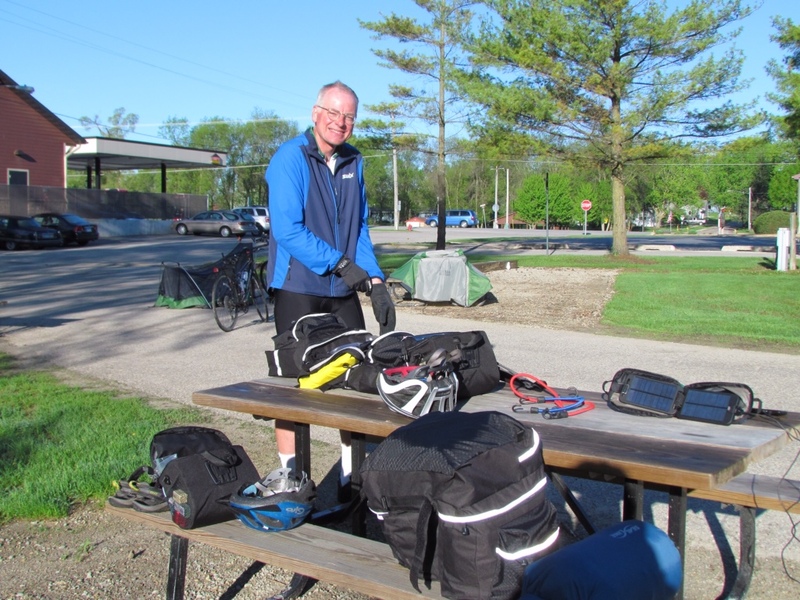 In fact, I learned a new term on this trip – apparently touring cyclists take great pride in being “self-contained.” We don’t quite meet the criteria as we do not carry food and cook kits. We choose to limit our weight to just sleeping gear. But that’s good enough for me. I expect to be warm and cozy tonight in our tent. And I’m already looking forward to my latte in the morning at the coffeehouse down the street. On our way into Caledonia yesterday, we noticed a number of barns with colorful patchwork quilt patterns on them. They were bright and attractive, but we didn't know why they were there. 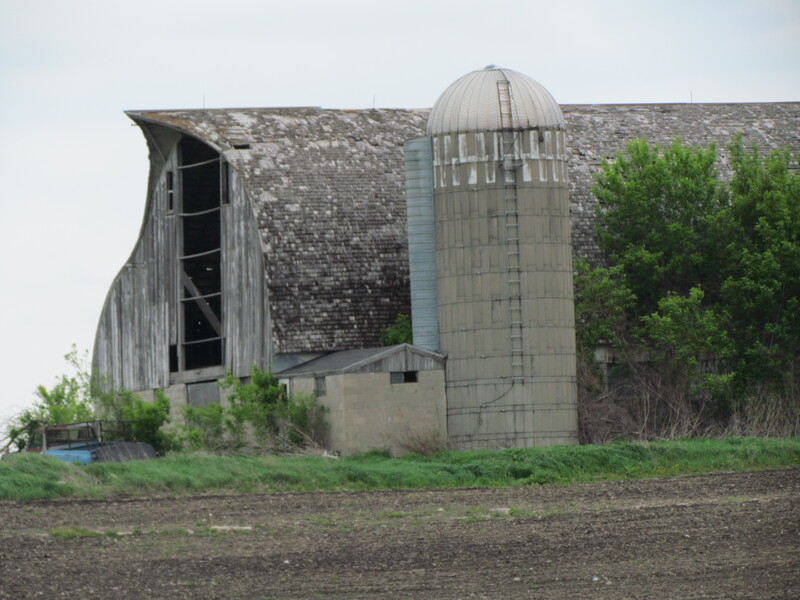 Reading up on the local sights, I discovered that they were “barn quilts.” It all began with one family who originally started it as a barn improvement project. The idea caught on, and over 60 barns now pay homage to the quilting heritage of the area, painted by local artists. For the start of this morning's ride, I enjoyed watching it for more of them. The countryside changed from the previous day as well. 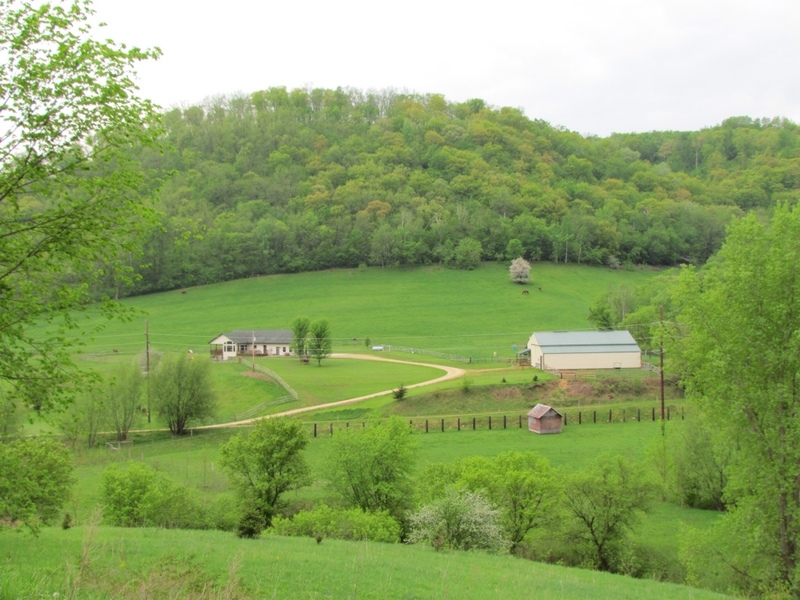 Trees seemed to dominate the terrain, with farms carved into niches among the woods. That was quite different from the wide open fields we'd seen earlier in our travels. To us it presented a very pastoral scene. As far as cycling goes, I'd have to say this was our easiest day yet. It wasn't the shortest, but we did most of it on a bike trail sheltered from the wind, with only gradual elevation changes, and cool temperatures. It doesn't get much better than that. But we still had our challenges. 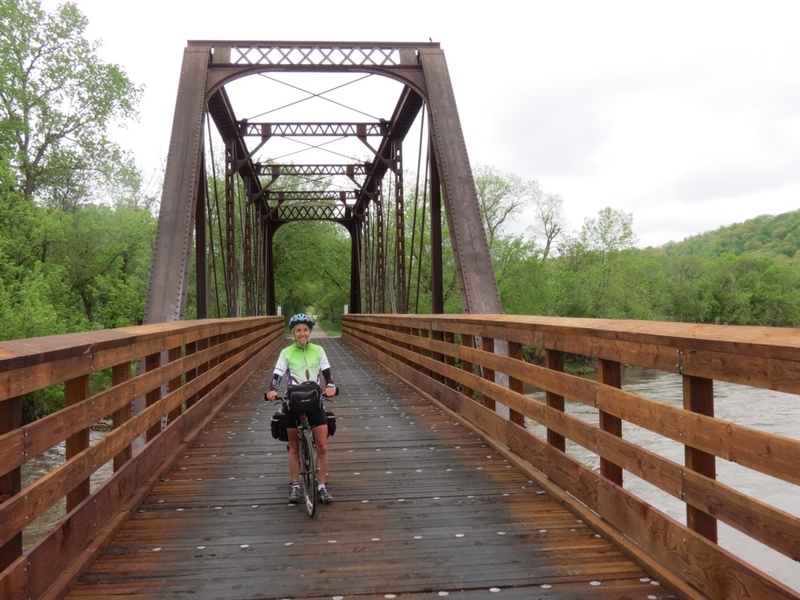 The plan was to follow the Root River bike trail for most of today's mileage. So imagine our disappointment at learning that over half of the trail was closed due to flooding. We even stopped in at the trail center in Houston to ask about it. While they thought the water may have receded, it was likely the trail was still muddy and slippery. So we did the prudent thing, and took the road instead. 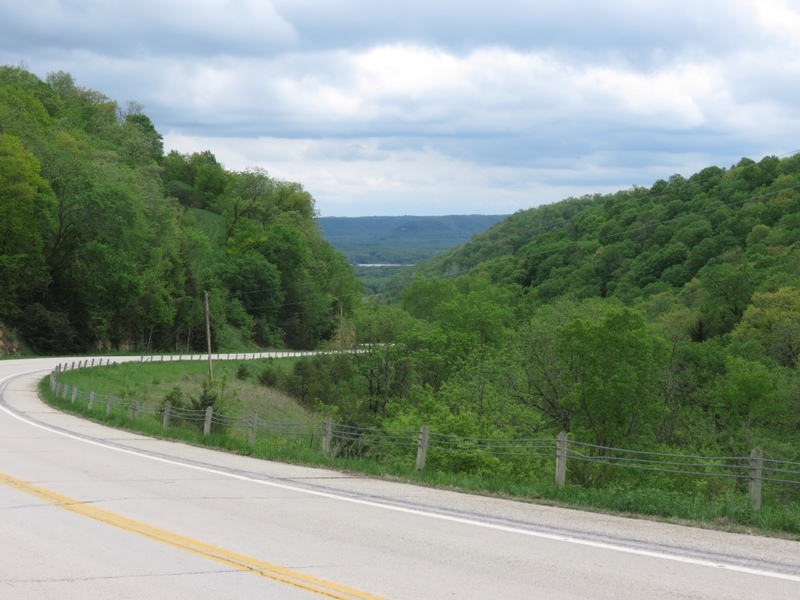 Once through Rushford, the wide shoulders disappeared from the road were were traveling and we were about to encounter bridge construction. Seeing the bike trail paralleling the road, it was easy to fall prey to the temptation to follow it… so we did. We were quite pleased to find it in good shape, and it was very pleasant to cycle down a tree lined trail with no traffic. We were feeling quite smug as we neared Whalen, thinking we had it made. Wrong! Suddenly we were mired in mud, left behind by the receding river. Not only had it buried the trail, but the adjoining dirt road was also reduced to muck. Forging onward as best we could, our bikes and shoes were magnets for the wet brown stuff. It took a garden hose and a good dousing before we could continue. Still, I'd have to say it was worth it! The remainder of the trail was officially open, which by then was a relief. 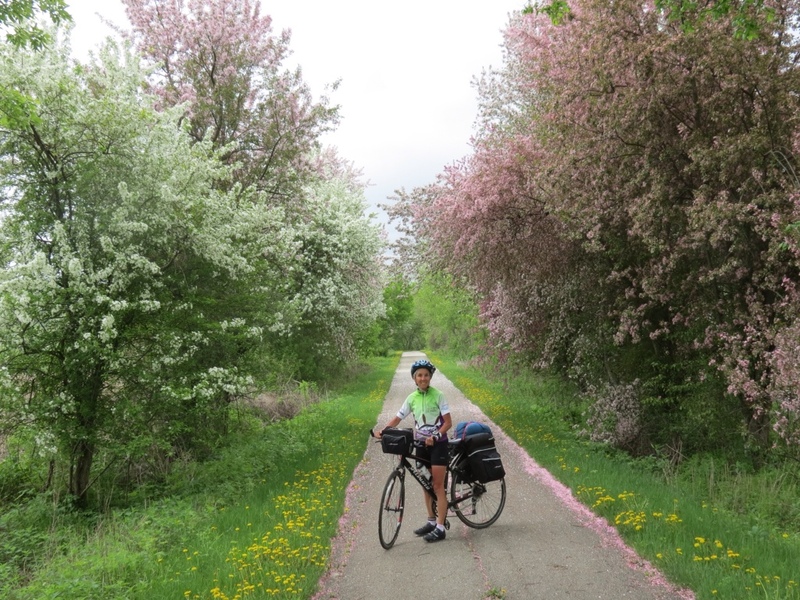 We enjoyed the flowering trees, wildflowers and birds that were in abundance. One portion of the trail was lined with high granite walls. Numerous bridges had just been reconstructed. And all along the way the swollen Root River flowed rapidly. 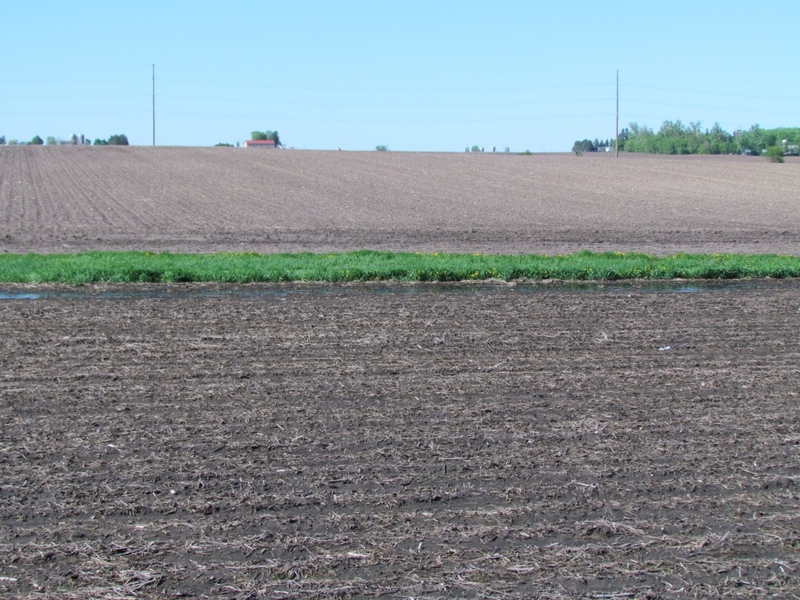 The farm fields lining the trail were largely still submerged in water, far from being ready to plant. A light drizzle fell for much of the afternoon – the first rain we've had while cycling this trip. But it was so light as to be insignificant. We arrived in Chatfield slightly wet and ready for shelter. I hadn't paid attention to the details of our accommodations for the evening, and assumed we were staying in a motel. The neighborhood just didn't look right, though – no wonder, Rich had booked us into another B&B! Unlike the mud, that was a very welcome surprise. By all rights, you should not be reading this post. We are supposed to be in a tent, sans Internet. But we caved. Instead, we are in a modest but well-equipped Mom and Pop motel room. But I'm getting ahead of myself. Today we crossed the Mississippi River and headed back North. It started out really well. We were on a much smaller road with little traffic. We were at river level, meaning it was nice and flat. And the wind was finally behind us for a change. 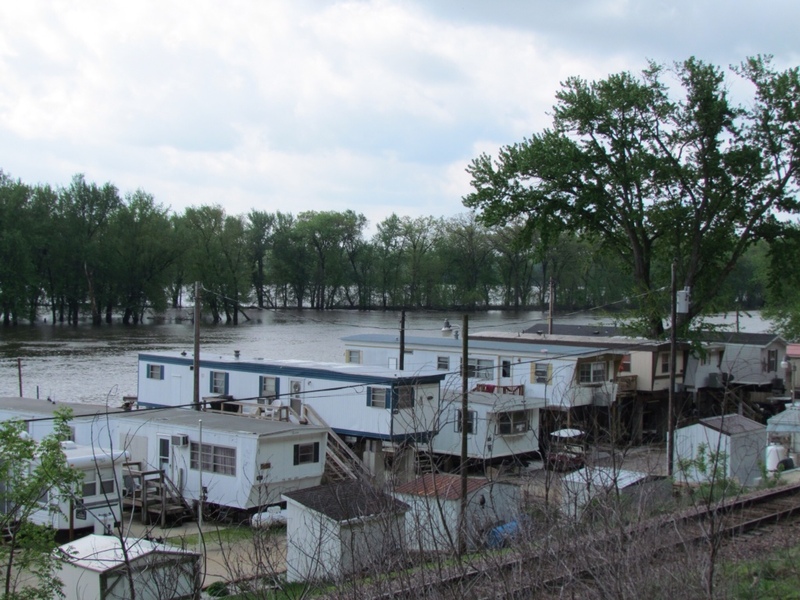 The first thing that I noticed was that in Iowa, they managed to squeeze houses, shacks and mobile homes between the railroad tracks and the river. Some of them were wisely built on stilts. I'd just never seen an elevated mobile home before! But it was justified – the river has just come down from flooding its banks, and trees were still marooned in the middle of the river. Early on we stopped at a National Monument to see some effigy mounds. There we met friendly volunteers, one of whom clued us in to the long, steep hill we were about to climb. We were grateful for the forewarning, as the 3-mile hill lived up to his predictions. What we didn't know was that it was only the first of four such brutal ascents we would face today! Every time we left the edge of the river, it meant a stiff hill to mount the bluffs. As long as we were in river country, that meant a steep downhill back to river level. Rich loved plummeting down at great speed, but to me (who hates speeding down) it was just unravelling all the hard work we'd just done. Our final hill took us inland for our detour into southeastern Minnesota. That time it felt rewarding to stay “up top” for the remainder of the day's ride. 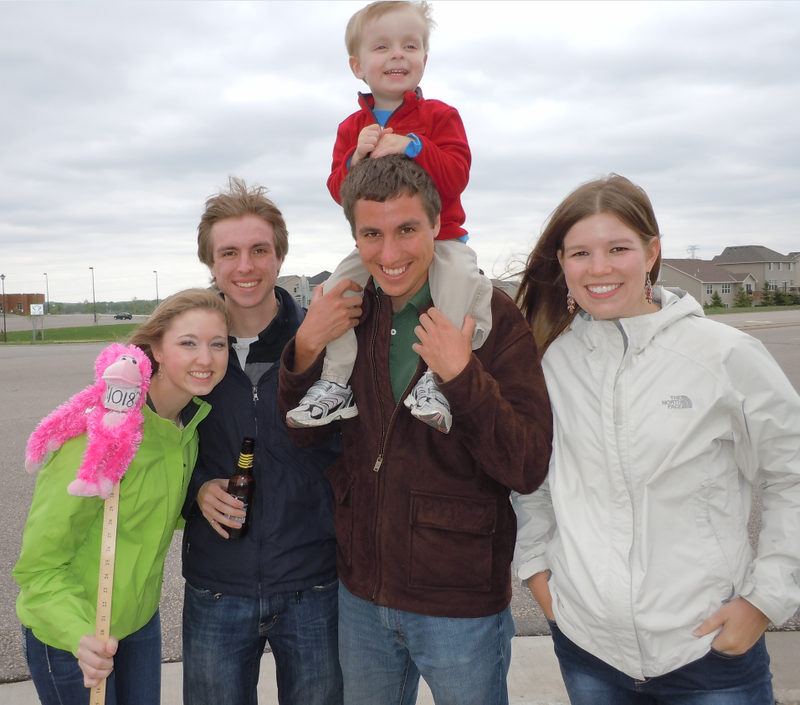 We were definitely in the heart of farmland, first in Iowa and then Minnesota. 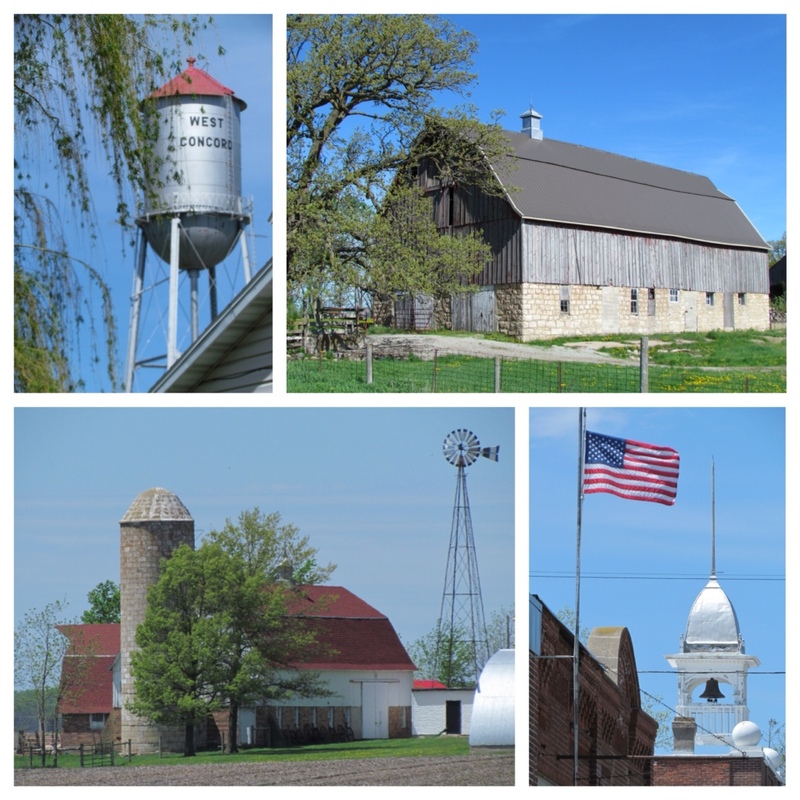 Pretty farm buildings, tilled fields, curious cows and a few horses were the primary features of the landscape. We even set one herd of cows off in a running pack as we passed. Given the quiet country roads, it was a very peaceful ride. It was at that point when Rich announced he was making an executive decision. We would seek out a modest motel instead of camping tonight. After all, he reasoned, it was our anniversary. Who was I to argue? I did feel a quick pang of regret that we'd given in so easily, but it was easily squelched. And so it was that we enjoyed a nice dinner and a bottle of wine to celebrate the occasion this evening. It also gave me the opportunity to drag Rich to the Dairy Queen to consume ice cream cones, just like we did on our wedding day 30 years ago. We have plenty of nights to spend in a tent. I enjoyed the outcome of this executive's decision. Breakfast! 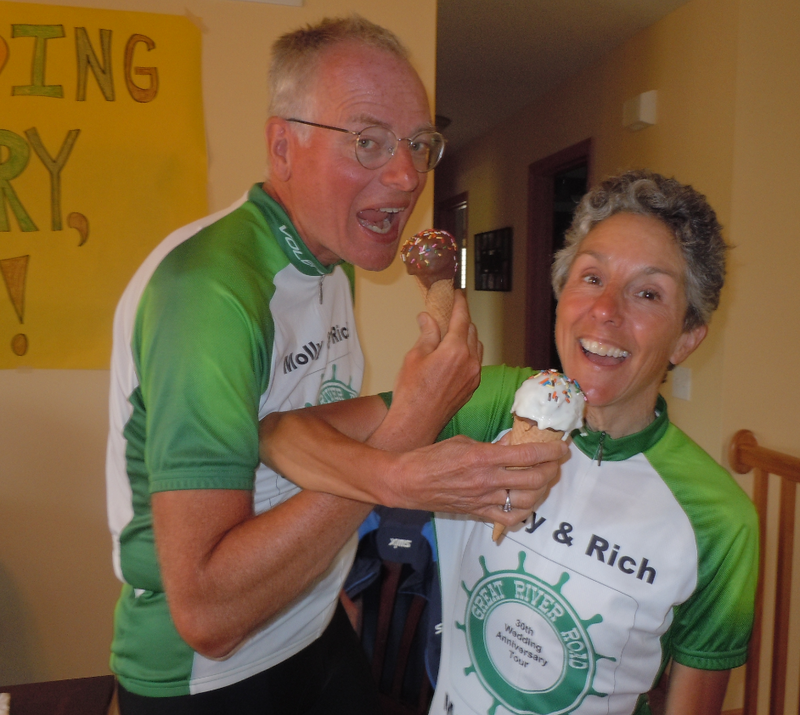 Normally, a staple of our cycling trips has been to stop for a hearty breakfast after logging about 20 miles, but that hasn't panned out just yet. We can't miss today, it's right downstairs. I can almost smell the coffee brewing! Flying with the wind. After battling fierce headwinds all the way down the river, we can't wait to turn North this morning and enjoy a tailwind. We should have a speedy ride today! It won't last, as we can already see a change to NW winds in the forecast, but we'll take it as an anniversary present today. A bit of cooler weather. I love the sun and warm weather, but even I will appreciate temperatures below the 80s today. And my sun-ravaged arms and legs will be thankful for the clouds. Camping. Yes, our anniversary night will be spent in a tiny tent it in a park somewhere. 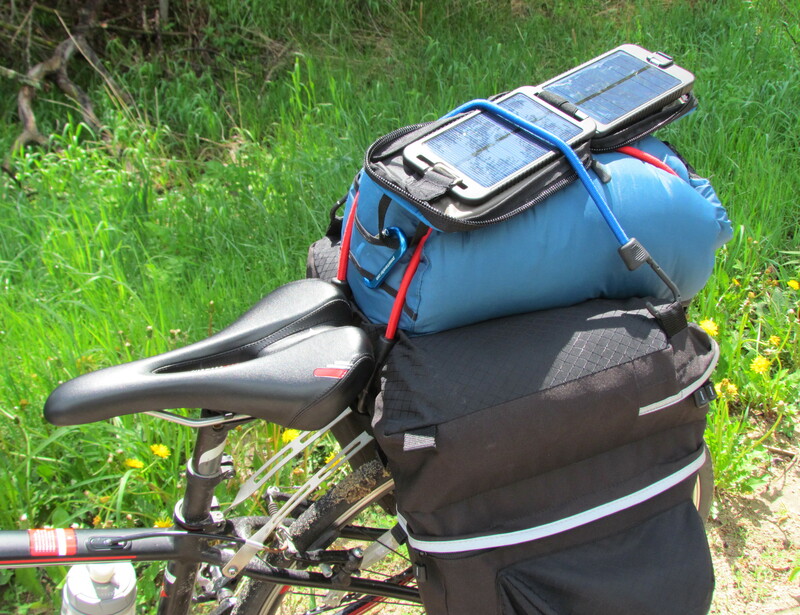 Dinner will likely be a picnic – whatever we can squeeze in with the rest of the gear on our bikes before leaving the nearest town. Marriage is an adventure, right? For 30 years it's been a great ride. I anticipate many more together!